It is amazing what will keep these kiddos attention! 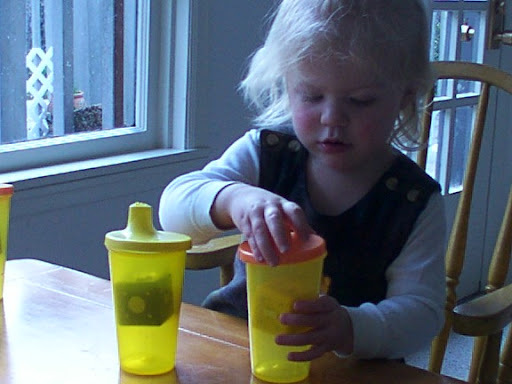 Today it was her musical toy blocks and her sippy cups. She got them all out of the basket in the kitchen, put them lined up on the floor, and proceeded to put a block in each one, put the lid on, take the lid off, and then take the block out. Over and over and over again. Then she slowly moved to the table, and did it all over again. She was doing this for nearly an hour. It was pretty amazing to watch!